Last evening, my weather station recorded the temperature at a peak of 37.1° C at 6:28pm. There was no way it was that hot. I even climbed onto the roof of the dunny to check the temperature. It was not that hot. 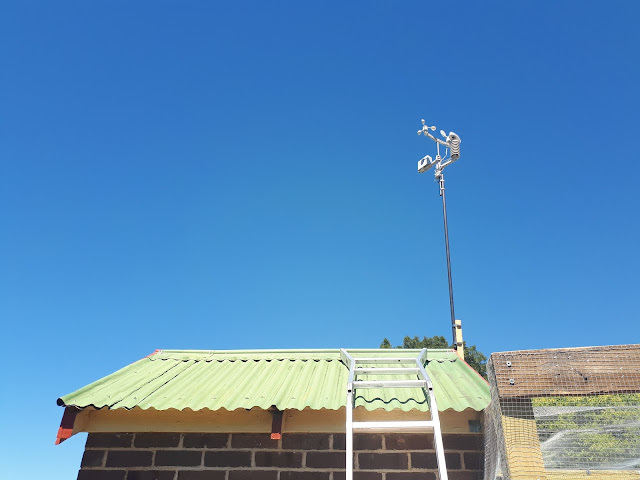 I checked the documentation for the station, and mine was only 1' off the roof - the recommended height is 5' - this explains why the temperature yesterday had peaked at around 34.4° C at 4pm - which I suspect was about right - only to drop and then suddenly increase as the sun dropped in the sky. I suspect the angle of the sunlight and the reflection off the roof at this time of day was the culprit. As soon as Gunning Ag & Water Solutions opened this morning, I obtained a solid poly stake and some hose clamps and set to work. Of course, I had originally set up the station before I had put the wire over the top of the chook pen. (I knew this would happen, but at the time I shrugged it off.) But thankfully my "Mission Impossible" ladder allowed me to get around the obstacle I had created for myself. I did not turn off the station before moving it, and this caused another issue. Apparently, the rain gauge functions with a drop-flap (a bit like the old aircraft toilets). This meant that at 9:30am, I recorded 5.7mm of "rain" due to the motion of the station while I added the stake. As you can see from the picture above, there was no actual rain this morning! The temperature as I write is 34.4° C. The nearest Weather Underground station is at Jerrawa (just up the road), and I am within 1° C of the reading there. It is a useful benchmark, as the Jerrawa Station uses a more expensive Vantage Pro2 weather station. This was certainly useful yesterday when I was recording 37° C while everywhere else was recording around 30° C.
I believe the weather station is now setup with the recommended specifications, and, within the capability of my system, the temperature information is accurate. The issues now are: (1) Is the radiation guard sufficient to keep direct sunlight off the sensor? and (2) Will the poly stake hold when the westerly blast-furnace winds begin again? Time will tell.